Mustard green and yoghurt salad is great for those who don't have a lot of time to prepare a meal, yet want to avoid eating ready meals or junk food. A mustard green and yogurt salad can be prepared in approximately 10 minutes and tastes delicious. 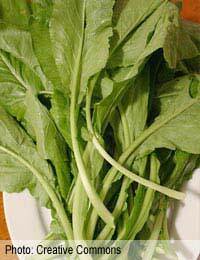 First make sure the mustard greens are well washed. Once washed, dry them well and take off any stalks before finely chopping them. Next take the mustard greens and place in a mixing bowl before mixing in the plain yoghurt. Once you have done this, and the ingredients are well blended, cover the bowl and place in your fridge. If you wish, you can also add mint to your mustard green and yogurt salad before serving to your guests. First take a large bowl and mix together the pepper, green onions, tomatoes and cucumber. Once you have done this take a small bowl and mix the salt, pepper, dill and yogurt well together before pouring the yogurt mixture over the salad, ensuring that everything is well coated. First take the spinach and, after giving it a good wash, remove any of its hard stems before draining the spinach of any excess water. Next, using their own juice, stew the spinach leaves in a large covered saucepan for approximately 20 minutes. This should allow the spinach leaves to become tender. Once cooked allow the spinach leaves to cool. Next take the garlic and yogurt and mix well together in a medium size bowl before adding to the saucepan and seasoning with salt and pepper. First take the vinegar and yogurt and mix well together. Once you have done this take the garlic and mint leaves and chop into fine pieces. Next take the beetroot and finely slice. After this has all been completed add the garlic, beetroot and mint to the yogurt, along with a pinch of salt, and serve to your guests.